Skillet breakfast potatoes aka diner-style "home fries" -- crispy fried with onions and peppers, and tossed with lemon juice. 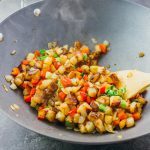 Add canola oil, potatoes, salt, and pepper to a wok. Stir until the potatoes are well-coated with oil. Place the wok over medium-high heat. Cook until browned and tender, about 15 minutes, stirring frequently so that the potatoes are evenly cooked. Add more oil if the wok gets dry. Add peppers, onions, and garlic to the wok. Cook until the peppers and onions are tender, about 5 minutes, stirring frequently. Remove the wok from heat. Stir in lemon juice and scallions. Serve while hot.